Dolls and Teddies will be very comfortable on it's padded checked pillow and mattress. 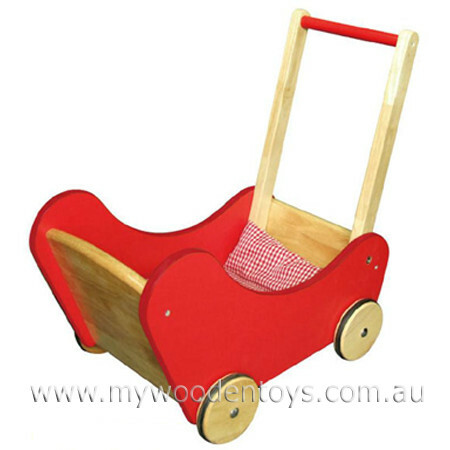 A great toy pram with rubber inserts on the wheels so it's quiet on wooden floors and also cant slip side ways if the pusher is not to steady on their small feet. The Doll Buggy Pram comes flat packed and is very easy to assemble. Material: Wood with Cotton Pillow and Mattress, Child Safe Paint . We like this because: "Children love pushing dolls and teddies around and this is a beautiful Buggy to do it in."